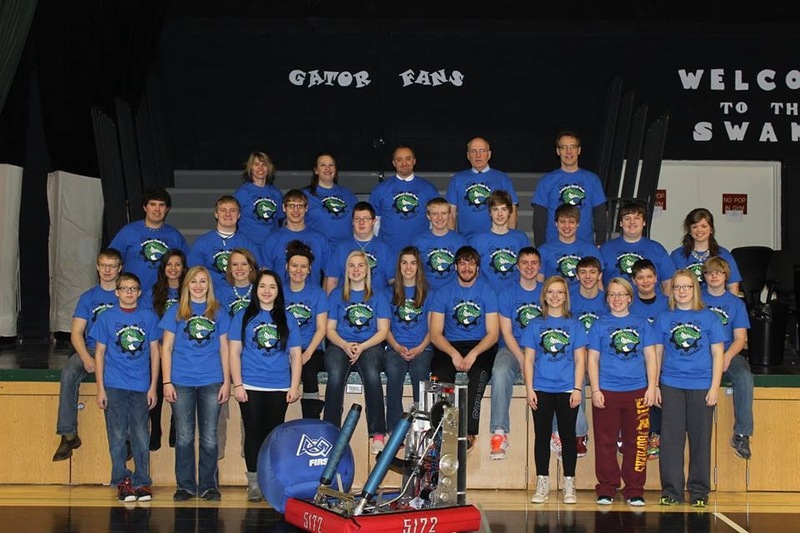 We are FIRST® Robotics Team #5172, formally known as the Gators. 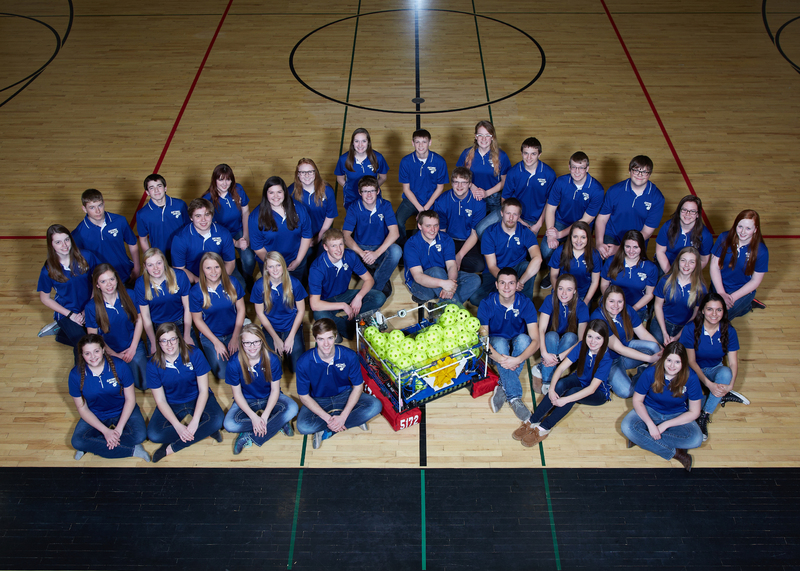 Our team was founded in 2014 as an effort to expand the opportunities available to Greenbush and Middle River students and to introduce a new activity into our area (in northern Minnesota.) The team consists of any high school students (grades 9-12) with an interest or passion for science, technology, mathematics, or engineering. The level of work our students engage in at school and in the community is directly reflected in the growing list of accomplishments our team has obtained. 2018- In the team’s fifth year, we were very competitive during Power Up with our robot, Fezzik. This year again, the game consisted of having to climb at the end of the match. The big difference between this years climbing challenge and others is in 2018 there was only one place for robots to hook on, resulting in more double, or even triple climbs. Our first event was at the Great Northern Regional where the team brought home two blue banners and multiple awards. At this event, we not only won the competition with our friends from Frazee, but also had our coach Mary Anderson bring home the Woodie Flowers Finalist award. Russ and Mary Anderson, co-chairs of the Great Northern Regional, also brought home the Volunteer of the Year award. At our second event, and the Medtronic Foundation Regional, we were not so successful but gave our drivers more experience for our trip to World Championships. At World Championships in Detroit, our team was placed in the Tesla division where we were able to make it to the divisional semi-finals. Our team had quite a year, not only with our robot and the awards we received at competition, but also the spotlight for outside media. 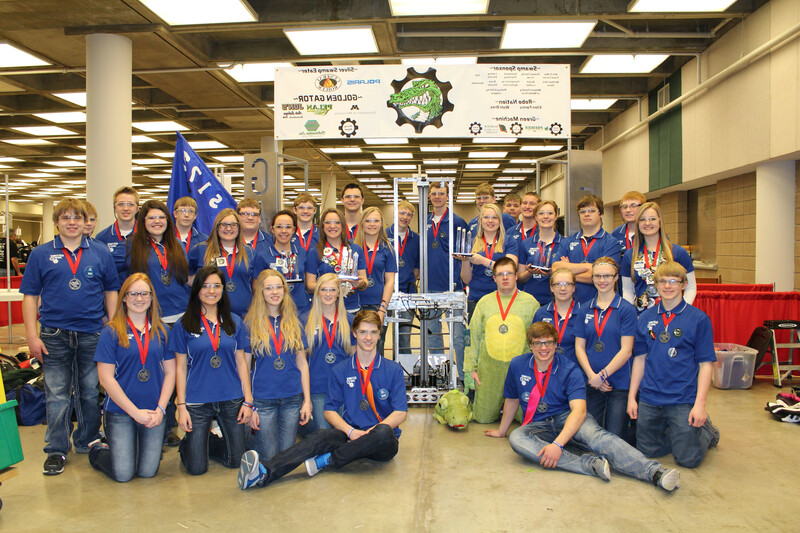 The team was featured in The Star Tribune and starred in their own documentary, Small Town Robot, produced by Joe Bradmier of Edina. We are thankful for all of the opportunities we were given in 2018 and are excited to continue making an impact in 2019. 2017- In our fourth year, the game was Steamworks™. This unique game provided multiple challenges we had to overcome including: shooting a five-inch wiffle ball into a goal 8 feet 1 inch off the ground, putting gears on the airship, and climbing a rope at the end of the match. The team worked hard to produce a successful robot named Hailstorm. At our first event in Duluth at the Northern Lights Regional the team lost during the semifinals but the came home with the Industrial Safety Award. The team was more successful at our second regional in Minneapolis at the 10,000 Lakes Regional where we were seeded 2nd after qualifications and ended up taking home the our second blue banner. 2016- Our third year, the game was Stronghold™. The goal was to work efficiently with two alliance teammates to cross as many defenses as possible, shoot 10″ foam balls into a high goal, and scale the tower. Balls were fed by the human player into the secret passage to be shot in the high goal or rolled into the low goal. Our robot this year perhaps is the best one to be built from Team 5172 yet, Apex, took us to the State Championships where we ended up first place. Bringing the first state championship home to our school. At Duluth, The Northern Lights Regional we placed 2nd, won Excellence in Engineering Award, and a Safety Hard Hat Pin Award. At the first ever Iowa Regional we took home our first blue banner and again the Excellence in Engineering Award. At World Championships we ranked 10th after qualifications and lost out in the semi-finals. 2015- On our second year, the game was Recycle Rush™. The goal was to work efficiently with two alliance teammates to get as many stacks of totes on the scoring platform as possible. There were two ways to get totes, out of the chutes or from the landfill. Three recycling bins were also on our side of the playing field. 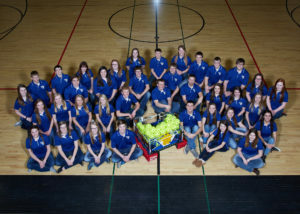 Our robot again this year was very impressive, Vortex, got us to the MSHSL State Championships again this year. During our second year, we placed 2nd at the Duluth Northern Lights Regional, won the Quality Award, and the Safety Hat Pin Award; we placed 4th at the Minnesota State High School League Robotics Championships. 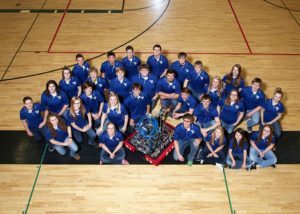 Check out Vortex on the Robots page. 2014- On our rookie year of 2014, the game was Aerial Assist™. The goal was to work as efficiently as possible with two alliance teammates to throw or push large, 2 ft. diameter balls into high or low goals. Additional points were awarded for being able to toss the ball over a truss standing at just over 5 ft. We were told that Aerial assist was the roughest game in FIRST history, and we believe that’s true after finishing the season with more than 5 broken wheels, 1 bent motor shaft, and dozens of very noticeable dents and scratches. We were very proud of our robot, Triplex, that not only made it through three competitions, but did extremely well. During our first year, we placed 2nd at the Duluth Northern Lights Regional and won the Rookie Allstar Award as well as being the highest seated rookie; we traveled to St. Louis to compete in the World Championships where we also did very well, placing 14th out of 100 teams in the Curie division; and we placed 3rd at the Minnesota State High School League Robotics Championships. Although we did well for Rookies, we know the challenge has only begun; we’re ready to give it our all here at the swamp! Check out Triplex on the Robots page. Please take the time to check out our match videos on Youtube: click here!